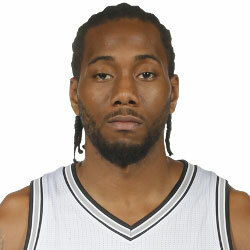 Kawhi Leonard. Again, yes, 2 years in a row. Spurs forward repeated as Defensive Player of the Year in the NBA. Leonard was the leader in the rear of the team that conceded the fewest points in the league. His leadership occupies the entire track. The two points are his. By winning in 2015 and 2016, the San Antonio forward becomes the second perimeter player to win 2 consecutive awards. Preceded by Milwaukee’s Sidney Moncrief, who won the first 2 editions (1982-1983 and 1983-1984). This is an award usually reserved for taller players. It is territory of the masters of performance, not height. In fact, since 2004, when Ron Artest won, only Leonard has broken the trend. Leonard had been voted first-place option in 84 of the 130 votes from sportswriters and broadcasters in the NBA, leading with 541 points. The second place was occupied by power forward, Draymond Green from the Warriors with 421 points and 44 first-place votes (second straight year in second). And the third place in a distance, Hassan Whiteside, center for the Heat totaling 83 points and two first-place votes. A spectacular defender from the Spurs, the small forward defended noticeably better for the team than without him in the court, per game he allowed the fewest points always within a spectacular defensive level, three points over the Utah Jazz. The defensive rating achieved with his presence is 94.9, without the forward in the court the team spikes to a 99.2 rating. The winner of the award averaged 1.8 steals, 1 block per game and 5.5 defensive rebounds throughout the season, And adding to his defensive performance he totaled some career-high points with 21.2 and 2.6 assists on average per game. The award, which was won by Marc Gasol in the season 2012-2013, has been dominated by -and mostly won by centers. Dikembe Mutombo and Ben Wallace are the players who have won it more times in history. They hold four awards each. The last non-center to win in consecutive years was back in 1989-90 and 1990-91 when Dennis Rodman claimed the award.